The sun was still high and traffic on Western Avenue still thick, yet the Empty Bottle was filling up, octogenarians clumping around the few tall tables, millennials ordering pints of Green Line from the cash-only bar. By 4:50pm, when 98.7s WFMT’s Relevant Tones program went live from the stage, the venue was nearing the capacity of a Friday night punk show. Despite the club’s 20 years bringing noteworthy bands to Ukrainian Village, this was the first live radio broadcast from the Empty Bottle, though it’ll be a surprise if this doesn’t plant a seed or two in the heads of other Chicago producers. The Thirsty Ear Festival, hosted by Relevant Tones’ Seth Boustead, a Chicago composer and founder of education and advocacy group Access Contemporary Music (ACM), was, judging by the performances and the crowd’s response and Boustead’s own admission at the close of the show, a huge success. Which means the organizers’ goal of making it an annual affair is most likely guaranteed. 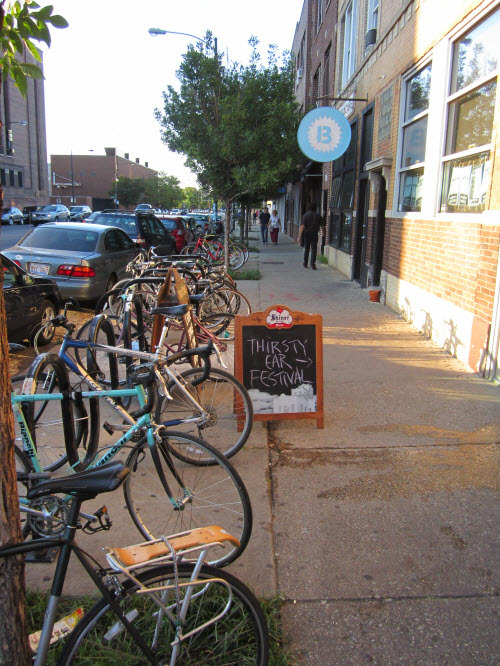 As this city does so well, Thirsty Ear was really a celebration of Chicago. A person connecting the dots of Chicago’s classical scene would quickly make an intricate web, and that was evident on Saturday. Not only were performers local, but so were many of the featured composers. Everything the Chicago Q Ensemble played was written by a Chicagoan. The Maverick Ensemble‘s Jason Raynovich slipped an original into the program, as did Boustead actually. Clarinetist James Falzone‘s set was a single, self-authored composed improvisation (more on that paradox in a minute). And the finale — the Boustead piece — also celebrated contemporary Chicago through visual art. “Three for Zhou B.” is a three-part rumination on a trio of paintings done by Bridgeport artists Shan Zuo and DaHuang Zhou. This festival was not a Pitchfork or a Lollapalooza. It wasn’t even a Square Roots, the new festival put on by the Old Town School of Folk Music, which though less exhausting than the larger fests still lasted an entire weekend. The Thirsty Ear Festival lasted exactly two hours. You could count the acts on one hand. Sets were limited to precisely thirty minutes. It was a tiny, self-contained, incredibly dense event, yet full of energy, like a small black seed that comprises all the living matter it needs to grow into a tree. Contemporary classical music is not for the faint of heart, or amateur of palate. Nearly every performance began with a singular steady note that grew into a teetering card house built from dissonant swells and combative dialogue between woodwind and string instruments. When the Maverick Ensemble told the audience that the Iannis Xenakis piece they were about to play might be the weirdest thing on the program, they were wrong. It was all weird. But beautifully so. Bookending the program were the more accessible compositions: Three selections by the Chicago Q Ensemble, a string quartet, and two by Palomar Ensemble, the performance arm of ACM. The Q Ensemble opened the show with the intensely percussive but smooth “What Would Kill Me” from Kyle Vegter‘s Fjords, then moved onto the first movement from Amy Wurtz‘s “String Quartet No. 1,” recently recorded by the Q Ensemble. This felt composed for wide plains, cinematic in places, reminiscent of Kronos Quartet’s work for Darren Aronofsky. The last piece, “Roots Run Deep” by percussionist and composer Brian Baxter, began with a shimmer. Although quiet, it had a physicality to it, the way your lips tingle when you hum. Slowly the quartet quickened its bows and raced, uphill, to the finish, their grimaces ignored by the silent tick-tock of the green digital clock set on the edge of the stage. 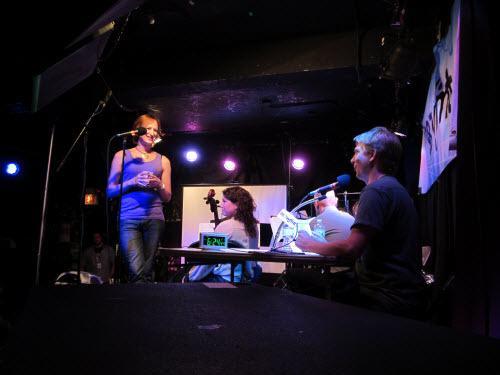 That clock, as a symbol, was a defining aspect of Thirsty Ear, which felt more akin to a live taping of This American Life or All Songs Considered than a typical Empty Bottle show. The card table tucked into a corner of the stage, set with a WFMT mic and two bottles of water. The giant 98.7 FM banner. The requests for silenced cell phones. The instructions of when to cheer and when to not. It was a different vibe than many festivals, but not better or worse. The energy was simply concentrated, not bouncing off the walls, and it required something of the attendees. Talking to your friends can be the best part of a rock show, but the Thirsty Ear Festival demanded your attention. After the Q Ensemble, composer James Falzone took the stage, armed with his clarinet and a handful of bells and prayer bowls. He took a minute to explain what was about to happen. “Sighs Too Deep For Words” was an improvisation that had been partially composed. A paradox? More like a narrative, he said. There were pivotal points, but each telling would vary. The story he told on Saturday traveled the spectral range of his instrument, not just in terms of pitch but also in tone, style, phrasing, mode, and certainly expectation. Though at times meditative, the “composed improvisation” was not all contented sighs. At various times, it seemed influenced by Arabic laments, Irish jigs, gypsy folk tunes, maybe even music from Super Mario Bros., certainly by Falzone’s work in the jazz world. It was at times chaotic, even violent: he kicked bells with his feet, rung the prayer bowl with his free hand, all while squirming in his chair like an uncomfortable kid. By the end, a thick layer of sweat blanketed his forehead, turned pale pink by the stage lights. If the performances were judged by sheer physical exertion, Falzone would’ve taken home the gold. It probably wasn’t intentional, but when the Maverick Ensemble took the stage after Falzone, it was hard not to imagine it a continuation of the first two acts. With Jason Raynovich on cello and Andrea D’Orio on clarinet, their first selection, “Private Games” by Israeli composer and University of Chicago professor Shulamit Ran, could’ve been a mashup of the Q Ensemble and Falzone. The Maverick Ensemble exists to perform work by underappreciated composers and artists from the past fifty years as well as new music. Its set fulfilled that vision, including “Charisma” by Greek composer Iannis Xenakis and work by Maverick’s own Raynovich, the ensemble’s artistic director. The latter was an outlier of the show. Composed by Raynovich and played by James Baur, “‘price” is a roughly ten-minute composition for a single acoustic guitar, and it was the first time on Saturday the audience saw the familiar instrument on stage. There was nothing familiar about the music however; Raynovich seemingly ignored sixty years of evolution, and treated the guitar like a singular classical instrument. The finger-picking never reached more than a few decibels over “almost inaudible.” As is often the case, what might be the most pleasant to actually hear on the radio may not have translated very well live. Gorgeous as it was and masterfully played, “‘price” would be better suited to a more standard classical venue. In the Bottle, the sound was swallowed, and after an hour of frenetic yawping, it was like the audience was too rattled to come down just yet. They wanted more. At each subsequent break, the Thirsty Ear audience seemed to feel increasing pressure regarding its status as an accomplice in making this festival a success. During performances, it would dutifully remain silent, out of respect for the music and the medium — a live broadcast is no place for loudmouths — but don’t ask a group of 150 hundred people to stay quiet for two hours straight. During stage changes, while Boustead recapped the performance for listeners just tuning in to the broadcast or explained distinctive elements of the selection, the audience gave a collective sigh of relief in the form of exuberant conversation, as if innumerable thoughts were bottled up inside of them and could just barely wait until a selection’s finish to come bursting out. The bar became a hive of activity in those few minutes. After the final break, the audience settled down for its final stretch of respectful silence, its patience lubricated by the quick burst of conversation and fresh drinks. Palomar took the stage, the largest and most diverse group of the evening, with bass clarinet, flute (and piccolo), violin, cello, and percussion. Lansing McCloskey‘s “Yellow” was riveting, with multiple movements and the right dose of energy for the penultimate selection. It also got one of the first audible reactions from the crowd, when the percussionist, on cue, smashed a piece of glass with a hammer. A sharp crack, and then a clatter that seemed to fold in on itself, the sound sucked into the collapsing shape before it hit the stage. There was a beat, then laughter and hoops and hollers. A few people joked about it being expensive crystal, which started rumors. It seemed, for a few minutes, the audience was given a free pass to talk during the broadcast. As the green digital clock determinedly marched toward 7pm, Boustead introduced his piece, the finale, “Three for Zhou B.” It was a multimedia affair. The paintings that inspired each movement were projected onto a screen behind the musicians. The first began with the quartet split into pairs, dueling in different registers, seemingly ignorant of one another or a time signature. It was decidedly less melancholy than much of the program, even whimsical at times, refreshingly so. Boustead watched intently, as if mentally critiquing his own work. The second movement was full of a certain gravitas, a weight that seemed to evoke the black anvil shape in the accompanying painting. It also had more experimental effects: The players blew into their instruments to create the sound of wind. They tapped their keys for jittery, insectile percussion. There was a hush over the entire movement, like autumn. Unlike the final movement, which was all energy, elegiac at times but mostly a full return to the triumphant whimsy of the first and a perfect closer. Despite the potential awkwardness of a radio host ending his show with his own work, there was the distinct sense that Thirsty Ear always was Boustead’s baby. Yes, he had the help of producer Jesse McQuarters and the WFMT crew, as well as the folks at the Empty Bottle, but in a sense, Boustead singularly created this festival: he organized it, hosted it, explained it, and took everyone in attendance along with him, including those tuning in from afar. There couldn’t have been a more fitting end or a truer celebration of Chicago contemporary art. Let’s hope Boustead and Relevant Tones return to the Empty Bottle next year, for the second annual Thirsty Ear Festival.